Keep track of your registered leads from the Leads navigation in the IDX Control Panel. You might see a new lead that doesn't appear to be genuine. These may appear with an identical first and last name, or the name is unintelligible, or the message they've sent is full of advertising links. These are known as "Spam Leads". With an increase in spam worldwide, IDX continues to work on improving methods to reduce these bad leads so that you can focus on providing the best service to real people. IDX Broker has incorporated several options to help reduce the number of Spam Leads your account receives. Besides the background processes that prevent bots from signing up with fake names, there are additional settings that you can control in your account. Spam lead prevention settings are found under Leads, in the Lead Registration section, Advanced mode, Sign Up Page tab. CAPTCHA is a tool to help tell a person from a computer. Some spam submissions come from programs, or "robots", that go out on the Internet looking for forms to fill out. The CAPTCHA in our system is a small box that a user clicks to confirm that they are not a robot. It is easy for your real leads to pass through the test, while preventing spammers from filling your inbox. Typically, this checkbox will be enough to validate your visitor, but if the advanced algorithms detect an anomaly, a fail-safe picture challenge will popup to ensure security. Reverse CAPTCHA is a similar kind of tool to help tell a person from a "robot". In this case, an extra form field is added to your contact forms and is hidden from the view of your visitors. A "robot", or computer spam program, will read the code of your form and attempt to fill out that field anyway. If a form submission comes through with anything in that hidden field, the IDX tools know that the lead is actually a Spam Lead and filters it out automatically. Reverse CAPTCHA is enabled on your search forms automatically. Occasionally, actual people instead of “robots” make spam submissions. These spam leads are not as easy to stop with CAPTCHA. If you are still getting Spam Leads even with CAPTCHA enabled on your account, you may wish to block out contact form submissions that originate from outside of North America. This statistically blocks out the majority of places from which spam originates. If you have a WordPress site running IMPress for IDX Broker, you have additional options available to you. Visit your initial settings to locate the option to add a Google reCaptcha. CAPTCHA authorization is based on your domain, so you can log into Google and add any domain that you want this CAPTCHA to be displayed on. Once the website is added, grab your key to enable this feature. 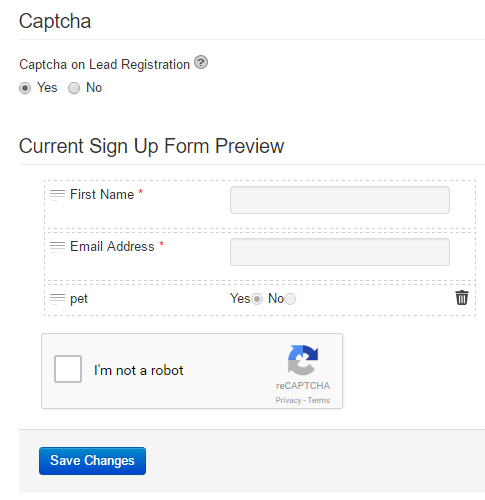 Your new signup widgets will now have CAPTCHA available to prevent spam signups. You may need to remove old signup widgets and replace them with new signups to see your CAPTCHA in use. NOTE: You will need to add the IMPress Lead Signup widget for the additional CAPTCHA functionality. At this time, the IMPress plugin only supports reCAPTCHA v2. This CAPTCHA capability is also available for IMPress Listings. Navigate to Listings -> Settings -> Advanced to input your Google Recaptcha key. If you are getting persistent Spam lead signups from the same individual, you can report this to the IDX Broker Support Team and we may be able to block the IP of that user. This will prevent them from seeing any IDX content at all. It is a total lock out. They will still be able to see your website, but not the IDX pages.